Are you planning an event? If so, then I can’t recommend Green Party Goods highly enough. From the amazing selection of eco-friendly products to the attentive customer service, Green Party Goods offers it all. My daughter and son recently turned 4 and 3 within one day of each other so we had a combined birthday party. I was very excited to learn about Green Party Goods because we try to incorporate eco-friendly products into our life whenever possible and parties tend to be one of our major “wasteful” times from the wrapping paper, to the paper plates and plastic utensils etc. Green Party Goods has the solution for all of your eco-friendly party needs. One party showstopper that really stood out to me was the Eco Cupcake Stands. We have smaller family parties so the mini Eco Cupcake Stand was perfect to display my baked treats for the party. The festive colors and decorative ribbon really makes it a lovely piece and it can hold up to 50 cupcakes. I was very impressed with the sturdy recycled corrugated cardboard. Green Party Goods has Eco Cupcake Stands to fit all of your party needs including the Round Eco Cupcake Stand which is so beautiful and would be excellent for upscale events and weddings. This larger stand can hold up to 200 cupcakes for the round design and 125 cupcakes for the square design. The stands are amazingly affordable starting at $25.95 for the mini Eco Cupcake Stand and up to $35.95 for the round Eco Cupcake Stand. On their big day, my little royal pair wanted to stand out. 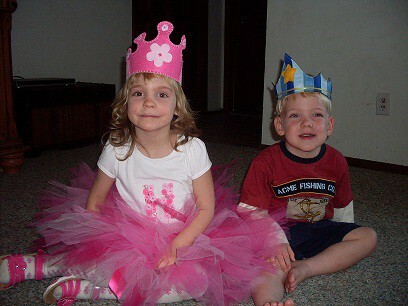 What better way to celebrate then to have their very own Felt King and Queen Crowns? When the special crowns were placed upon their hands and the “royal duo” were introduced to the crowd (their aunt and uncle), you should have seen the confidence and pure innocent joy on their little faces. The Felt King and Felt Queen Crowns were very well made with lovely detailing and had a comfortable and easy fit. It will be a treasured birthday keepsake that is worn year after year on their special day. This was an incredible value for only $6.00 per crown! As we get to know one another, it is no secret that I love toys that inspire the imagination and encourage my children to play freely. I was so excited to watch my son open his No-Battery Eco-Rocket. It was worth the wait….he LOVED it! I also think that my 5 year old son and husband liked it just as much as he did because they all took turns waiting to play with it. It is made with recycled non-PVC plastic and comes in a neat recycled pulp gift box that is super easy to open. 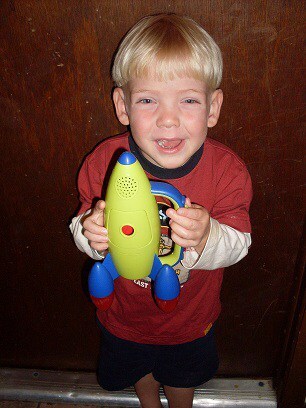 As for the Eco-Rocket, simply crank it up (my kids love this part), push the button and it is countdown to blast off. The handle makes it easy for little hands to navigate as they fly around outer space (the house). Three days after opening the Eco-Rocket box and this remains a favorite toy for all of my children. It is official….. I have given my children a toy that I like to play with best of all. I actually got an “Oh mommy. This is our present so can we have it ?” And so I reluctantly gave them back their Retro Wooden Prince and Princess Theatre. I can’t tell you enough how much I love this toy. From the simple building of the theatre (my eldest son’s job), to the setting up of the wooden stick puppets to the actual stage performance….this is such a fun and unique toy. My children spent hours making up characters and performing a show for us. This entire set including the stage and wooden stick puppets (on a dowel) is a steal at only $13.00. Now…if only I can convince my kids to let me be in their next production. Green Party Goods has “planet friendly products for every celebration.” What makes this a “must go to “ shop is that it is eco-friendly and affordable too. 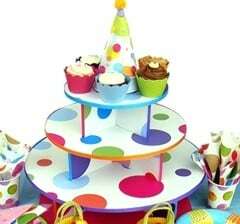 You can purchase everything you need to make your next party a smash from tableware, gifts, toys, party favors, cupcake stands and so much more…you just have to stop by Green Party Goods! I would also love to have the Recycled Paper Cupcake Wrap Princess. I subscribed to Green Party good newsletter. and the blue ones as well. I like the eco panda pick up sticks favors. Thanks. Voted for you on Who’s Who already tonight. Voted for you on Picket Fences already tonight. Subscribed to the Green Party Goods newsletter.